Many non-cigarette tobacco products, including e-cigarettes, contain various flavourings, such as fruit flavours. Although many flavourings used in e-cigarettes are generally recognised as safe when used in food products, concerns have been raised about the potential inhalation toxicity of these chemicals. Benzaldehyde, which is a key ingredient in natural fruit flavours, has been shown to cause irritation of respiratory airways in animal and occupational exposure studies. Given the potential inhalation toxicity of this compound, we measured benzaldehyde in aerosol generated in a laboratory setting from flavoured e-cigarettes purchased online and detected benzaldehyde in 108 out of 145 products. The highest levels of benzaldehyde were detected in cherry-flavoured products. The benzaldehyde doses inhaled with 30 puffs from flavoured e-cigarettes were often higher than doses inhaled from a conventional cigarette. 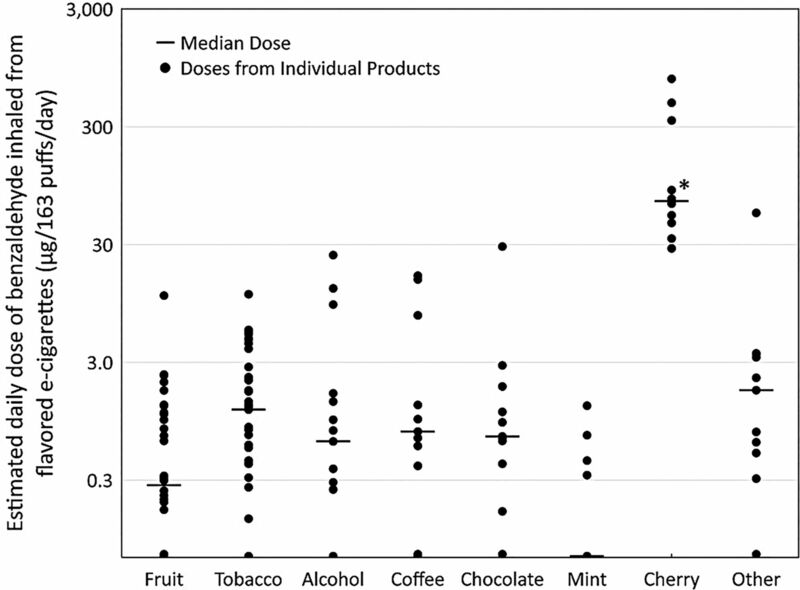 Levels in cherry-flavoured products were >1000 times lower than doses inhaled in the workplace. While e-cigarettes seem to be a promising harm reduction tool for smokers, findings indicate that using these products could result in repeated inhalation of benzaldehyde, with long-term users risking regular exposure to the substance. Given the uncertainty surrounding adverse health effects stemming from long-term inhalation of flavouring ingredients such as benzaldehyde, clinicians need to be aware of this emerging risk and ask their patients about use of flavoured e-cigarettes. Current estimates show that 12.6% of US adults report ever use of electronic cigarettes (e-cigarettes), a number that continues to rise.1 Recent studies confirm that e-cigarettes presumably pose lower health risks to the user due to the disparity in toxic compounds found in e-cigarettes relative to tobacco cigarettes.2 While the 2009 Family Smoking Prevention and Tobacco Control Act gave rise to a US ban on added, non-menthol flavourings in cigarettes,3 currently, non-cigarette tobacco products, including e-cigarettes, are permitted to have added flavourings (eg, candy, fruit). Although many flavourings used in e-cigarettes are generally recognised as safe when used in food products, concerns have been raised about the potential inhalation toxicity of these chemicals.4 The potential effects flavour compounds may have on the respiratory health of e-cigarette users are unclear. A recent report by Barrington-Trimis et al4 outlined the need for research on flavour additives used in e-cigarettes, noting the lack of safety data on long-term health effects from inhaling flavouring chemicals. One such flavouring compound, benzaldehyde, is an aromatic aldehyde used in food and cosmetics.5 Although data suggest little to no toxicity from oral and dermal exposure to benzaldehyde, occupational exposure has been linked to irritation of the eyes and mucous membranes of the respiratory passages.5 Given the potential inhalation toxicity of benzaldehyde to e-cigarette users, we examined benzaldehyde levels generated from flavoured e-cigarettes. We hypothesised that aerosol generated from flavoured e-cigarettes would contain significant amounts of benzaldehyde. We measured benzaldehyde in aerosol generated from an e-cigarette refilled with 145 flavoured nicotine-containing solutions purchased from international online retailers. The solutions were classified into eight flavour groups according to labelled characteristics: berry/tropical fruit (n=40), tobacco (n=37), alcohol related/drink (n=15), chocolate/sweet flavour (n=11), coffee/tea (n=11), mint/menthol (n=10), cherry (n=10), and other, non-identifiable flavour varieties (eg, ‘Indian Summer’, ‘Cosmopolitan’) (n=11). A refillable eGo e-cigarette (heater resistance 2.4 ohm, battery 900 mAh, 3.4 V) was used for testing. Aerosol was generated using an automatic smoking simulator following protocols used in previous studies (inhalation time 1.8 s, puff volume 70 mL, interval between puffs 17 s).6 For each experiment, 30 puffs were taken from each e-cigarette in two series of 15 puffs, with a 5 min interval between series. Benzaldehyde from aerosol was trapped on sorbent tubes, extracted and analysed using a high-performance liquid chromatography method as recommended by the US Environmental Protection Agency.7 The lower limit of quantitation (LLOQ) was 0.025 μg/30 puffs. A Kruskal–Wallis test was performed to assess differences in the distributions of benzaldehyde levels according to flavour grouping. For each product tested, we calculated a daily inhaled dose of benzaldehyde, assuming that an experienced e-cigarette user puffs on an e-cigarette 163 times a day.8 We compared the inhaled dose using 30 puffs from a flavoured e-cigarette with an inhaled dose from a single tobacco cigarette (0.5–4.5 μg/cigarette).9 We also compared the inhaled dose from flavoured e-cigarettes with a hypothetical dose inhaled by healthy workers who would be exposed during an 8 h work shift to the permissible exposure limit (PEL) of benzaldehyde as defined by the US Workplace Environmental Exposure Level Guides10 (90.5 mg=inhalation rate 1.3 4 m3/h×8 h×8.7 mg/m3 PEL). Benzaldehyde was detected in 108 out of 145 examined products (levels above LLOQ). The highest yields of benzaldehyde were observed in cherry-flavoured products (5.129–141.2 μg/30 puffs). Benzaldehyde yields in aerosol generated from cherry-flavoured nicotine solutions were significantly higher than in other products (χ2(7)=43.70, p<0.0001; Kruskal–Wallis test). Benzaldehyde yields in non-cherry-flavoured products were within the range of 0.025–10.27 μg/30 puffs (table 1). The benzaldehyde doses inhaled using 30 puffs from flavoured e-cigarettes were often higher than doses inhaled from a conventional cigarette. The estimated median daily inhaled dose of benzaldehyde from cherry-flavoured e-cigarettes was 70.3 μg, which would be >1000 times lower than the PEL dose for benzaldehyde concentrations in the workplace (figure 1). Estimated daily doses of benzaldehyde resulting from inhaling flavoured e-cigarette aerosol (163 puffs per day10) (n=145). By examining benzaldehyde levels in aerosols generated from a wide range of flavoured nicotine solutions, our study demonstrated that elevated levels of benzaldehyde exist in cherry-flavoured products. Users of cherry-flavoured products may inhale significantly higher doses of benzaldehyde compared with users of other flavoured products. Although this study has several limitations, including an arbitrarily selected testing protocol that may not reflect actual product use, this study points out a potential risk associated with using flavoured e-cigarettes. As e-cigarette popularity increases, respiratory clinicians need to be aware of potential risks that may result from use. Although e-cigarettes may be a promising harm reduction tool for smokers, findings indicate that using these products could result in repeated inhalation of benzaldehyde, with long-term users risking regular exposure to the substance. Given the uncertainty surrounding adverse health effects stemming from long-term inhalation of flavouring ingredients such as benzaldehyde, patients should be asked about use of flavoured products, particularly patients with respiratory diseases.
. Electronic cigarette use among adults: United States. NCHS Data Brief, no 217. 2014. Hyattsville, MD: National Center for Health Statistics, 2015. American Industrial Hygiene Association. WEEL Values. American Industrial Hygiene Association. 2011. https://www.aiha.org/get-involved/AIHAGuidelineFoundation/WEELs/Documents/2011WEELValues.pdf (accessed 25 Aug 2015). Contributors Conception and design: LK, AS and MLG. Analysis and interpretation: AP, JK, MZ, JK, DS and MLG. Drafting the manuscript for important intellectual content: AS, DS and MLG. Funding This research was supported by the Medical University of Silesia (grants KNW-2-007/D/4/N and KNW-2-016/D/5/K), Institute of Occupational and Environmental Health (grant ZSiTG9) and by NIDA/NIH and FDA Center for Tobacco Products (CTP) (grant 3R01DA037446). Competing interests LK, AS, AP, JK and MZ are employees of the Institute of Occupational Medicine and Environmental Health. One of the institute's objectives is outsourcing for the industrial sector, including manufacturers of e-cigarettes. However, this has no influence on studies design, conducting studies, manuscript preparation, statistical analysis or other relevant scientific work conducted in the Institute of Occupational Medicine and Environmental Health. AS accepted personal fees from the eSmoking Institute in Poznan, Poland, and non-financial support from Chic Group LTD, a manufacturer of electronic cigarettes in Poland, outside of the submitted work. In 2011, MLG received the Global Research Award for Nicotine Dependence funded by Pfizer, a manufacturer of stop smoking medications.